I recently attended the 2015 PAC conference hosted by the Public Affairs Council. During one of the conference sessions, I looked around the room and noticed that we were all diligently taking notes, trying to capture every bit of wisdom the speaker was sharing with us. As I flew home later that day I found myself wondering how many of us would feel simultaneously energized and overwhelmed when we landed? I knew most of my peers weren’t returning to a PAC team, they were the team. The ones responsible for understanding what they were required to convey their audience, what the legal parameters around their efforts were and trying to apply newly acquired marketing approaches. No wonder the pens were flying across the page at the conference! So what would make integrating these new ideas more manageable once we were all back at our desks? I firmly believe the answer is making sure whichever new technique or strategy we are most excited about fits with our unique PAC environments and will resonate with our eligibles. One of the approaches we use when working with clients is to spend time gathering research before planning which PAC outreach techniques we will implement. 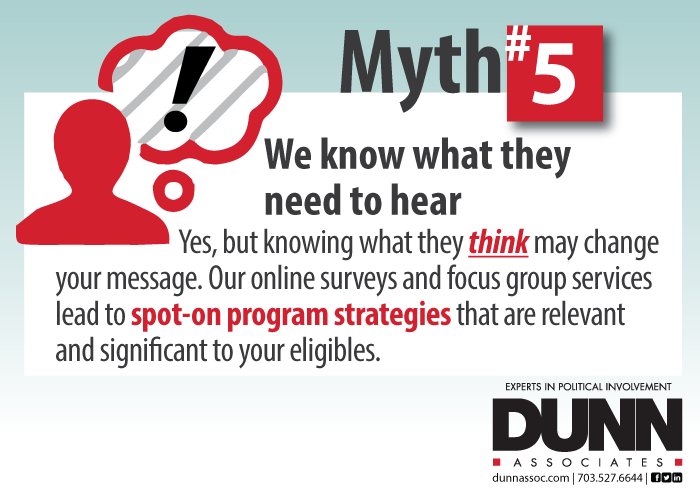 This is most often done through online surveys, focus groups and small group information sessions. We also look at what existing data tells us; measuring the success of existing campaigns and gaining insights about PAC eligibles with demographic information. I have found that putting research first makes it easy to understand what will work for a PAC and what won’t; making the planning process much more intuitive and less overwhelming for all of us. Part 5 of a 5 part series focusing on common myths that can become roadblocks for PAC Managers. Read the whole series: Myth #1 – I Got This!, Myth #2 – Don’t Ask Too Often, Myth #3 – We’re Not Ready For Peer to Peer, and Myth #4 – Newsletters! Who Needs Them?! PAC Myth #4 – Newsletters? Who needs them?! PAC Myth #1 – I Got This!